The countdown for Longines Global Champions Tour of Rome is underway, with the 15th - and penultimate - leg of the 2018 Championship race reaching fever pitch. 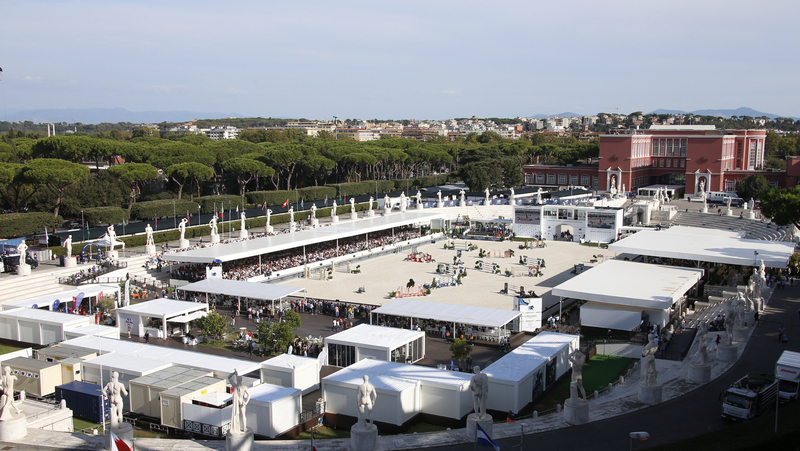 From the 6th - 9th September, the Stadio dei Marmi will welcome the very top horses and riders in the world to it’s unique arena for the 4th consecutive year, with a four day festival of show jumping taking place in Italy’s capital city. The presence of the 4th Carabinieri Mounted Regiment will bring an element of tradition and history to the Stadio dei Marmi. Their famous historic carousel - with the classical line up of 145 horses - will culminate in the Regiment’s now-legendary and hair-raising final charge which reenacts the glorious “Carica di Pastrengo”. LGCT Rome reaffirms the social value of the horse, with the concept that ’sitting on a horse, we are all equal’. This slogan inspires the Equestrian Centre of San Raffaele Viterbo, a healthcare facility registered with the national health system which offers a comprehensive rehabilitation service. Their well-known carousel performed by children will be staged at Stadio dei Marmi ‘Pietro Mennea’. The performance is a symbol for equal opportunities, and will be a very special moment for spectators and all involved. From a sporting perspective, fans and VIPs will be treated to four days of exceptional sport as the top international riders in the world compete for the lions share of the 600,000 euro prize purse on offer in Rome. The 300,000 euro 1.60m Longines Global Champions Tour Grand Prix of Rome will take centre stage on Saturday afternoon, with overall leader Ben Maher (GBR) in a position to secure the 2018 title with a strong result next weekend. With the winner of the LGCT Grand Prix of Rome also qualifying for a place in the GC Playoffs Longines Global Champions Tour Super Grand Prix, riders will be fighting tooth and nail for a golden ticket and a chance at a further 1.25 million euro prize purse this December in Prague. Saturday's highlights will include the second round of the GCL team series, where home city squad, the Rome Gladiators, will try to defend or better their provisional 3rd position in the overall ranking. And this year the battle has been turbo-charged with a brand new concept for show jumping. The new GC Playoffs will also feature the GCL Super Cup with over €10 million in prize money, the ultimate showdown in show jumping. The full international CSI5* rider list will be announced soon.